Among the important figures of the 20th century, Churchill and Einstein competed with each other for the distinction of being labeled “Person of the Century” by Time magazine. At first sight they seemed different in almost all respects. Yet to some extent they had similar personalities and over time their thinking developed in not entirely different ways. They also liked each other—from the time they met in 1933 at Chartwell, Churchill’s country estate. This, of course, was entirely counter to Churchill’s view of the system from which he himself had benefited through his writing. Since the late 1890s, when he was a young war correspondent, Churchill had supported himself and his lavish lifestyle with revenues from writing. The immense sales of his memoir, The Second World War (1948-54), would eventually make him a rich man.4 Churchill was also an upper-class aristocrat, born at Blenheim Palace, which his ancestor John Churchill, First Duke of Marlborough, had received from Queen Anne for defeating the armies of Louis XIV in the late 17th century. Certainly Churchill had no sympathy for Einstein’s belief in, as he wrote, “a soundly administered socialist society” where “work is undertaken not for the profit of a propertied minority but for the satisfaction of the needs of all.”6 As early as 1919 Churchill had referred to the Soviets’ “silly system of economics,” their “absurd doctrine of an impossible equality.” In January 1919, he called communism a “pestilence more destructive of life than the Black Death or the Spotted Typhus.” Of the USSR a few months later he emphasized that “the policy I will always advocate is the overthrow of that criminal regime.”7 To some extent these remarks were made for dramatic effect, long before Churchill met Maisky and began courting the Soviets as partners against Hitler. But despite his wooing of Maisky and Stalin, Churchill had always rejected socialism as an economic and social system. Landau, of course, was aware of Churchill’s antipathy. He also knew that the former prime minister was usually in need of a penny or two. He offered Churchill $5000 ($65,000 in today’s money) for an article rejecting Einstein’s piece. The tone of his letter suggests that he was confident Churchill would accept. Landau was being a little disingenuous since, in June 1945, it had been he—as head of the Jewish Telegraphic Agency—who lured Einstein into writing his article in the first place. The issue, he told the scientist, had “become acute” during the British general election, when Churchill had argued that a Labour victory “would mean the establishment of a totalitarian system” in Britain.8 Einstein duly obliged, though he differentiated between the socialist ideal of justice and solidarity and the Soviet Union, which he considered a distortion of true socialism. While Churchill disagreed with Einstein’s socialist leanings, he respected Einstein’s supremacy in the world of science. The physicist’s groundbreaking research on the Theory of Relativity, including the concept of mass-energy equivalence (“E=Mc2”) and many other discoveries, had justifiably made him world famous. Einstein clearly was “unique…in a league by himself.”12 The eminent physicist Freeman Dyson, one of Einstein’s successors at Princeton, told biographer Walter Isaacson that “scientists who become icons must not only be geniuses but also performers, playing to the crowd and enjoying public acclaim.”13 Churchill, a great performer himself, would recognize this. In addition, Dyson, who arrived at the IAS in 1948 and thus knew Einstein, explained to this author that the physicist was “blessed with complete self-confidence,” and never worried about being in a minority all by himself.14 This too was a personality trait Churchill possessed in abundance. Aside from respecting Einstein as a scientist and sympathizing with his plight as a Jew, Churchill had another reason not to attack his political articles: The two had been acquainted since 1933, when Einstein was a luncheon guest at Chartwell. 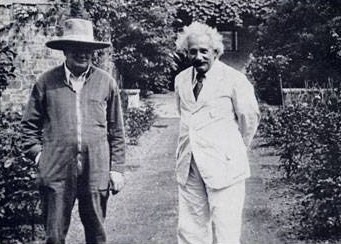 Einstein and Locker-Lampson, together with Lindemann, duly arrived for lunch in late July. They seemed to enjoy each other’s company.28 Einstein’s pacifist leanings were now muted, given what he called “the gospel of force and repression currently prevailing in Germany.” Much to the distress of some of his admirers, Einstein had concluded that the Nazi “threat cannot successfully be combated by moral means; it can be met only by organized might. To prevent the greater evil, it is necessary that the lesser evil—the hated military—be accepted for the time being. Should German armed might prevail, life will not be worth living anywhere in Europe.”29 There was nothing here with which Churchill would disagree. During his visit, Einstein asked Churchill for his help in providing sanctuary for Jewish German scientists at British universities. Churchill had been out of office since 1929, and was only a private Member of Parliament with limited influence. Still, Churchill suggested that Lindemann contact British universities about offering positions to German scientists. Lindemann, however, had already done so, and had been on a “recruiting drive” in Germany the previous May.30 Subsequently, a number of Jewish German scientists (though far fewer than Lindemann and Einstein had hoped) found new homes at British universities. Einstein then left England for Belgium, where he stayed in the pretty village of Le Coq, near Ostend. This was uncomfortably close to Germany, and there were constant rumors that the Nazis had put a price on his head. On a renewed invitation from Locker-Lampson, Einstein returned to England for a series of lectures. He stayed mainly at Cromer, Norfolk, where, coincidentally, the Churchill family had holidayed in the days leading up to World War I.33 On 2 October 1933, before leaving for Princeton, Einstein joined other luminaries (Churchill not among them) in an event at London’s Royal Albert Hall to raise money for refugee scholars from Germany.34 Two weeks later, on October 17th, Einstein, his wife, his assistant and a secretary arrived in Princeton. He never returned to Europe. Churchill and Einstein’s luncheon meeting at Chartwell in late July 1933 confirmed their views of Hitler’s threat to global civilization. Seeing the world alike in this regard, the conservative aristocrat and the socialist Jew resolved to fight on the same side of history. Later, in the nuclear age, they would come to share another conviction: that the splitting of the atom had changed the world in a dramatic way and nuclear proliferation must be prevented. Shortly before his death on 18 April 1955, Einstein put his signature to a manifesto drawn up by Bertrand Russell on the dangers of nuclear war. It led to the annual Pugwash conferences on Science and World Affairs.35 During his peacetime government from 1951 to 1955, Churchill strove to ease the Cold War through summit conferences. After Stalin’s death in March 1953 he hoped—in vain, as it proved—that reconciliation with the Soviets might be possible.36 Churchill, like Einstein, was cognizant of the value of cooperation and negotiation. In addition to thinking alike at key junctures in history, Churchill and Einstein also shared personal traits. “The comparison is not surprising once the picture-book image of both scientist and statesman is scraped away to reveal the machinery beneath,” wrote Einstein biographer Ronald Clark. “Of Churchill it has been written [by C.P. Snow] that almost obsessional concentration ‘was one of the keys to his character. It was not always obvious, but he never really thought of anything but the job in hand. He was not a fast worker, especially when dealing with papers, but he was essentially a non-stop worker.’ Einstein…was much the same.”37 No wonder that they liked each other. Klaus Larres, author of Churchill’s Cold War, is a member of the Institute for Advanced Study (IAS) in Princeton, New Jersey. He is the Richard M. Krasno Distinguished Professor of History and International Affairs at the University of North Carolina at Chapel Hill and a Senior Fellow at the Center for Transatlantic Relations, Johns Hopkins University/SAIS, Washington, DC. 1 Klaus Larres, Churchill’s Cold War: The Politics of Personal Diplomacy (New Haven: Yale Univ. Press, 2002); Fraser Harbutt, The Iron Curtain: Churchill, America, and the Origins of the Cold War (Oxford: Oxford Univ. Press, 1988). 2 Jacob Landau to Winston Churchill, 20 March 1946: Churchill Archives Centre Cambridge CHUR 2/229. (I am grateful to Richard Langworth for this information). Einstein’s article was attached to Landau’s letter but can also be found in David E. Rowe & Robert Schulman, eds., Einstein on Politics: His Private Thoughts and Public Stands […] (Princeton: Princeton Univ. Press, 2007), 435-38. 3 Rowe and Schulman, eds., ibid. 4 See David Lough, No More Champagne: Churchill and His Money (London: Head of Zeus, 2015); and David Reynolds, In Command of History: Churchill Fighting and Writing the Second World War (New York: Basic Books, 2006). 5 Gabriel Gorodetsky, ed., The Maisky Diaries (New Haven: Yale Univ. Press, 2015), 124. Reviewed at https://winstonchurchill.hillsdale.edu/the-maisky-diaries/. 6 Rowe and Schulman (eds. ), 437. 7 For the various quotes, see Larres, Churchill’s Cold War, 39-42. 8 Rowe & Schulman (eds. ), 435. See also R.B. McCallum & A. Readman, The British General Election of 1945 (Oxford: Oxford Univ. Press, 1947), 247-71; John Ramsden, The Age of Churchill and Eden 1940-1957 (London: Longman, 1995). 9 Larres, Churchill’s Cold War, 123-39, 189-239, 384-85. 11 Foreign Relations of the United States (FRUS) 1946, VI: 734: U.S. ambassador Bedell Smith to the Secretary of State, 5 April 1946 (top secret) on his conversation with Stalin in the Kremlin on 4 April. 12 Conversation with Freeman Dyson at the Institute for Advanced Study (IAS), Princeton, New Jersey, 2 November 2016. 13 Walter Isaacson, Einstein: His Life and Universe (New York: Simon & Schuster, 2007), 269. 14 Conversation with Freeman Dyson, 2 November 2016. 15 See Peter L. Galison, Gerald Holton & Silvan S. Schweber (eds. ), Einstein for the 21st Century (Princeton Univ. Press, 2008), 74-91. See also Robert Rhodes James, The Making of the Atomic Bomb (New York: Simon & Schuster, 1988); Graham Farmelo, Churchill’s Bomb (New York: Basic Books, 2013); Kevin Ruane, Churchill and the Bomb (London: Bloomsbury Academic, 2016). 16 Galison et al (eds. ), Einstein for the 21st Century, 74-77. 18 Banesh Hoffmann & Helen Dukas, Albert Einstein: Creator and Rebel (New York: Viking, 1972), 171. 19 For some of the details, see Galison et al (eds. ), Einstein for the 21st Century, 74-91. 20 Thomas Wilson, Churchill and the Prof (London: Cassell, 1995); Adrian Fort, Prof: the Life of Frederick Lindemann (London: Jonathan Cape, 2003). 21 Ronald W. Clark, Einstein: The Life and Times (New York: Harry N. Abrams Publishers, 1984), 104-05. 22 For the latest excellent book on Hitler’s rise to power, see Volker Ulrich, Hitler: A Biography. vol. 1, Ascent, 1889-1939 (New York: Vintage Books, 2016). 25 From Einstein’s travel diary in Denis Brian, Einstein: A Life (New York: John Wiley, 1996), 219. I am grateful to Marcia Tucker, librarian of the Historical Studies/Social Science Library, Institute for Advanced Study, Princeton, for referring me to examples of Einstein’s sense of humor. 29 Otto Nathan & Heinz Norden (eds. ), Einstein on Peace (New York: Simon & Schuster, 1960), 235. 33 Albrecht Foelsing, Albert Einstein: A Biography (New York: Viking, 1997), 676-77. 34 Nathan and Norden, Einstein on Peace, pp.236-37; Brian, Einstein, p.250. 35 Galison et al (eds. ), Einstein for the 21st Century, 93-96. 36 Larres, Churchill’s Cold War, 189-239; Klaus Larres & Kenneth Osgood (eds. ), The Cold War after Stalin’s Death: A Missed Opportunity for Peace? (Lanham, Md. : Rowman and Littlefield, 2006); also John W. Young, Winston Churchill’s Last Campaign: Britain and the Cold War, 1951-5 (Oxford: Clarendon Press, 1996).